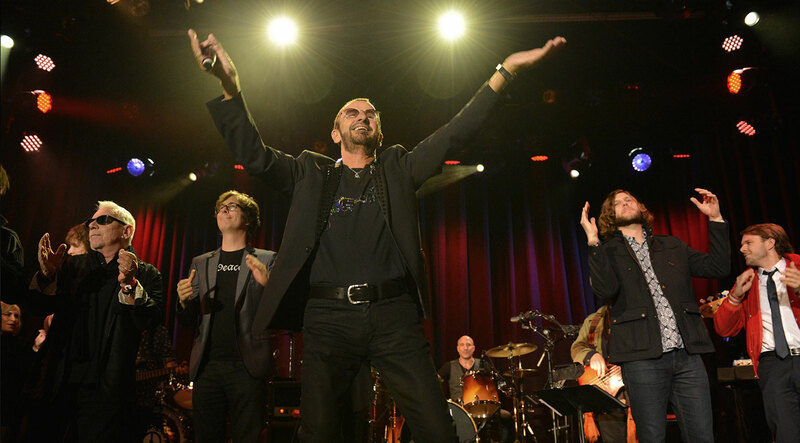 Ringo Starr was honored amidst 450 of his closest friends and supporters with the ‘DLF Lifetime of Peace and Love Award’ on January 20, 2014 at the El Rey Theater in Los Angeles. The evening featured stellar performances by headlining artists including Brendan Benson, Ben Folds, Bettye LaVette, Ben Harper, and Ringo Starr himself. Ringo received the award from David Lynch, who was also celebrating his 68th birthday that evening. Lifetime friends Paul McCartney and Yoko Ono contributed video messages to the evening, sharing stories of Ringo’s years of dedication to peace, love, and of course, Transcendental Meditation (TM). On the occasion of his award, Ringo inaugurated a Peace & Love Fund to help bring Transcendental Meditation to at-risk youth in Los Angeles. Every dollar raised for the Ringo Starr Peace & Love Fund, up to $1 million, will be matched by a generous donor and Ringo Starr fan.